Recently PCworld took snapshot measurements of wireless service in 13 cities--Atlanta, Boston, Chicago, Dallas, Denver, Las Vegas, Los Angeles, New Orleans, New York, San Francisco, San Jose, Seattle, and Washington, D.C, to see which companies are currently delivering on the promised faster speeds. • AT&T's new LTE network turned in the fastest download speeds of any 4G service. Its 3G service was very competitive, too--and those two results help make a strong case for AT&T dual-mode 3G/4G phones. 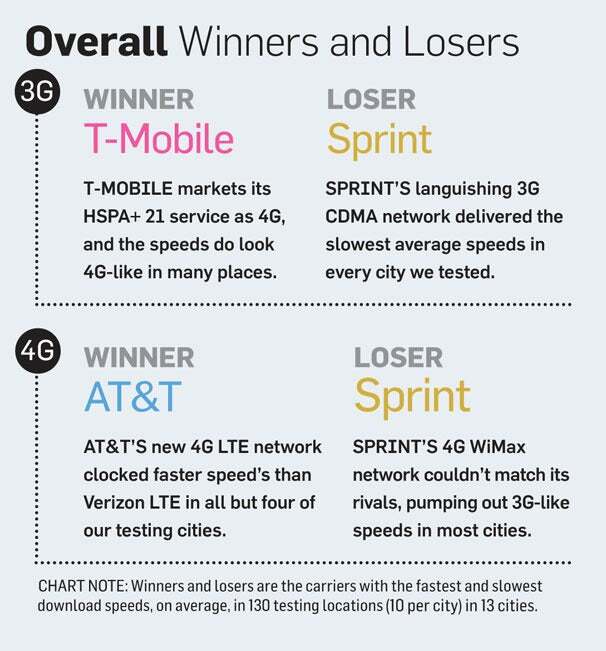 • T-Mobile's HSPA+ 21 service won in the 3G bracket of our study, and the company's high-end HSPA+ 42 service competed reasonably well with other providers' 4G service. 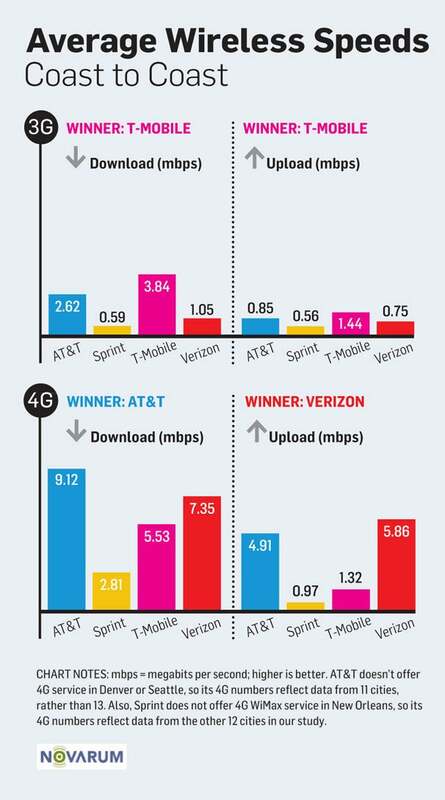 • Verizon makes 4G service available in many more locations than other providers do, and its 4G upload speeds are top-of-the-line, but its 4G download speeds don't match AT&T's. And Verizon's 3G speeds are not improving much, especially when compared to the competition. • Sprint was consistently a laggard in our wireless speed derby. The company seems to have virtually stopped developing its existing 3G and 4G networks while looking for a way to make the transition from its outdated WiMax 4G technology to LTE. I know its not an American network but I got these result a year or so ago on the Bell 3g network 15 minutes north of Toronto Ontario.